Steph and Jon are the type of people that exude friendliness. They’re positive, outgoing, and want to be your friend. I met Steph back in the early 2000’s when she was my bible study leader in high school and I’m so glad we stayed in touch. I was honored when they asked me to do both a maternity photoshoot and newborn photography. If you can’t already tell, these two LOVE baseball. And not just any baseball, the San Francisco Giants. When I walked into cute little Finley’s room, I was greeted by energetic orange, a bat signed from a recent World Series championship game, and adorable baseball themed decor. 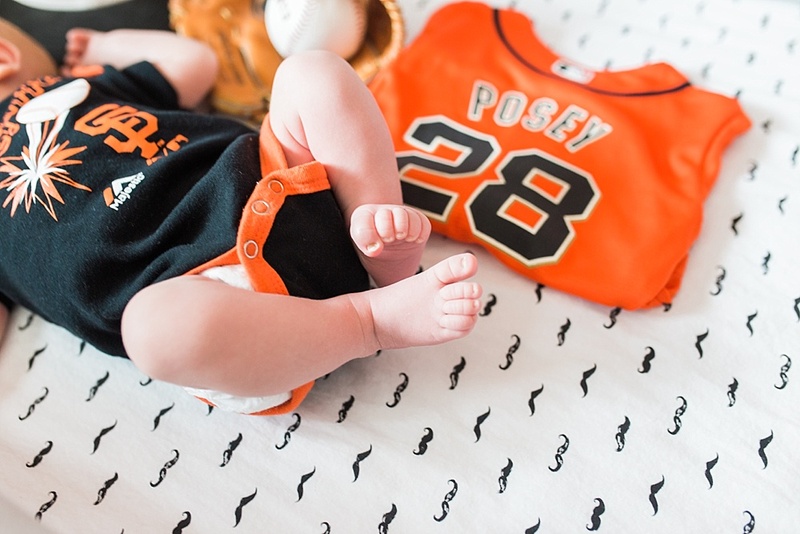 Don’t forget the little one who rocked his Giants’ onesie. Newborn photography reminds me that there’s more to life than the stress. Nothing is quite as cute as little baby toes! I’m so glad I got to take a small glimpse into the Sawyers’ life and home as they adventure on the journey of parenthood! Contact Ashley to schedule your newborn photography shoot today.